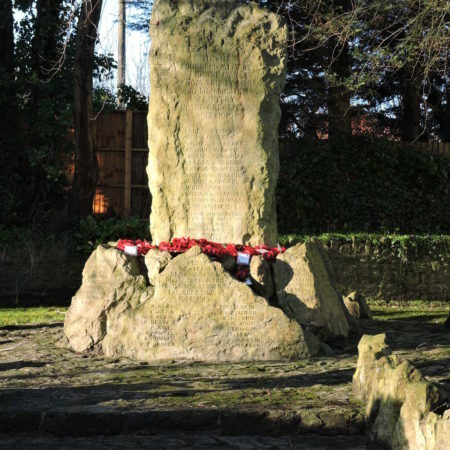 Our commemoration of the end of the First World War continues with another instalment in Mike Statham’s study of war memorials in south Wales. Mike’s main interest is in the design and construction of the memorials. For a slightly different perspective, we look forward to several database projects. There’s one based in Swansea University and one led by Powys County Council. 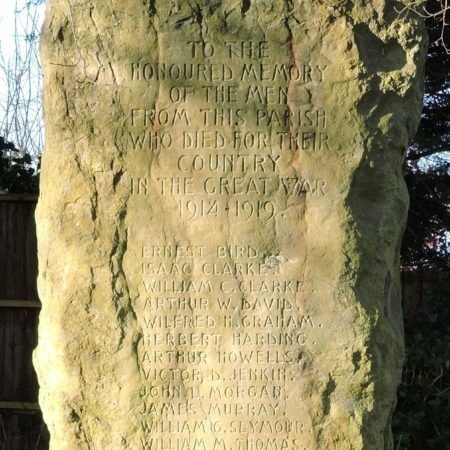 The Wenvoe memorial is unusual in that it lists the names of those who served in the war and returned. The Tongwynlais memorial also lists the names of those who served. At Wenvoe the dead are listed separately, on the central stone, but at Tongwynlais the dead and survivors are all in the same list. together with their names (thirteen in all). The names of three men who fell in WW2 have been added below the WW1 list. 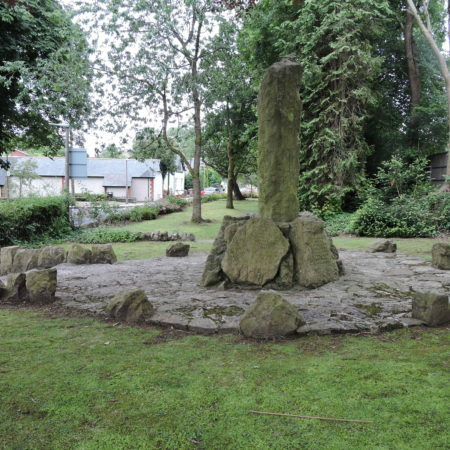 The main stone is surrounded by nine large stones of irregular size all about 3ft 3in (1m) in height. 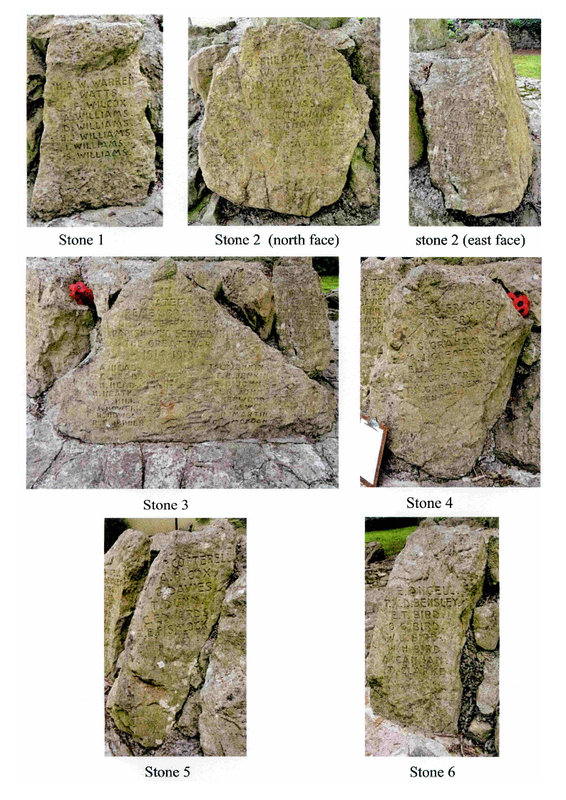 Six of these stones bear inscriptions of the 63 men from the village who served and survived (one bears names on two of its faces). All the stones are rough, as obtained from the quarry, except the areas bearing the inscriptions and names, which have been dressed. They are composed of Carboniferous Limestone from the Alps Quarry, Wenvoe, doubtless a place where some of the men were, or had been employed. 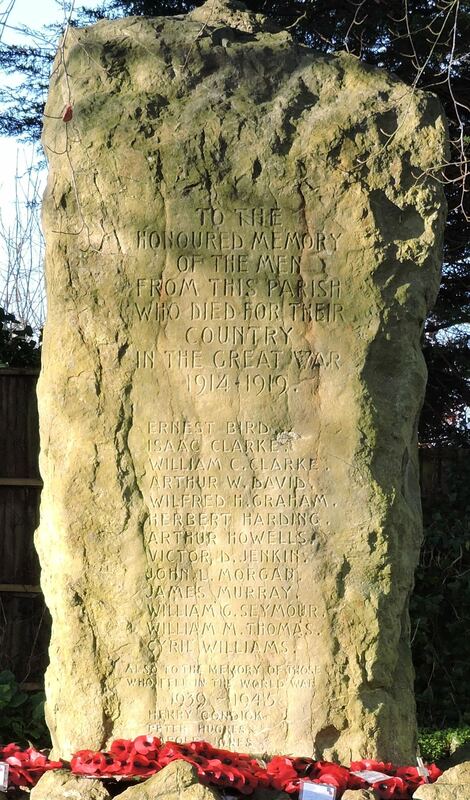 Some of the stones have weathered rather badly exhibiting many cracks and a few of the names are now difficult to read. 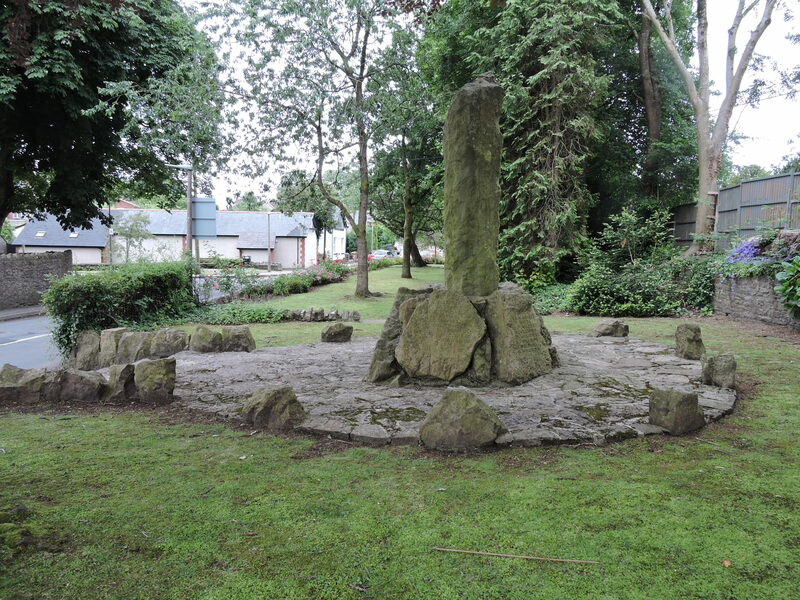 The memorial stands in its own grassed enclosure, at the centre of a circular stone-paved area on the periphery of which are nine other irregular shaped limestone boulders inter-spaced at roughly regular intervals. 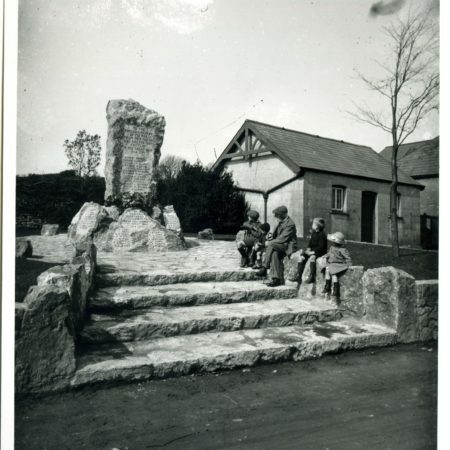 The area can be accessed via a flight of three steps up from Old Port Road which are flanked by walls of limestone boulders and also via a single low step up from the main area of the park on the south side; Figure 2. 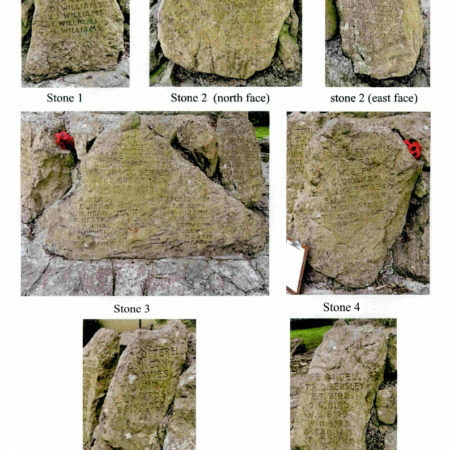 Close-up photographs of the front face of the main stone and each of the basal stone faces bearing names are presented in Figures 3 & 4. 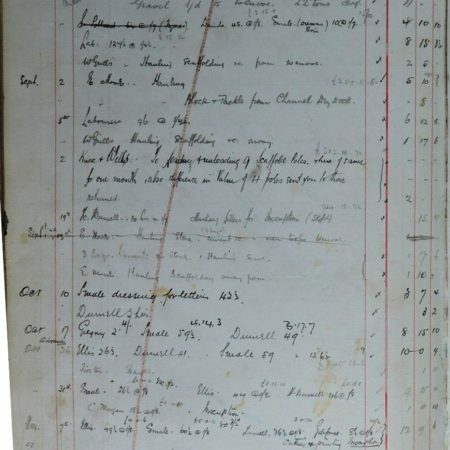 The names on each stone are listed at the end of this report. 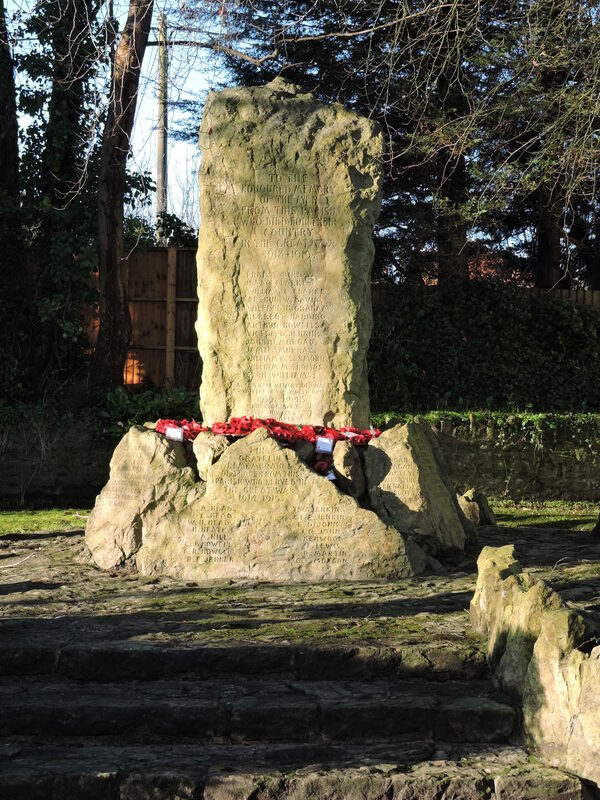 The memorial was designed by sculptor William Clarke who had retired prior to the start of WW1 and had moved from Llandaff to live at Upper House in Wenvoe. Work commenced 23 May 1919 with William’s son Guy preparing a sketch for the project. This took 2½ hours, his rate of pay being one shilling an hour. Much of the early work was done on the stones whilst still at the Alps Quarry. 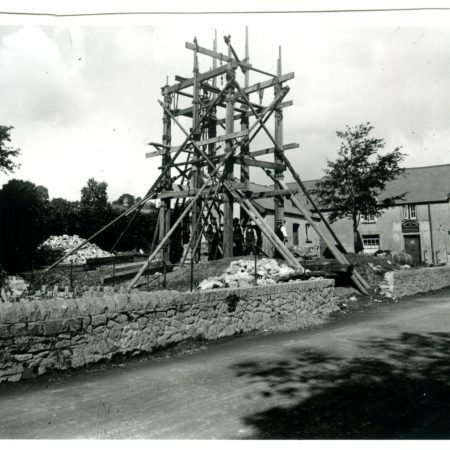 The stones were then hauled up to the site where they were erected on a concrete foundation. The job was completed in mid November. Excluding haulage, hire of tackle and equipment and sharpening tools, a total of about 2,455 man hours was spent by Clarke’s workforce. 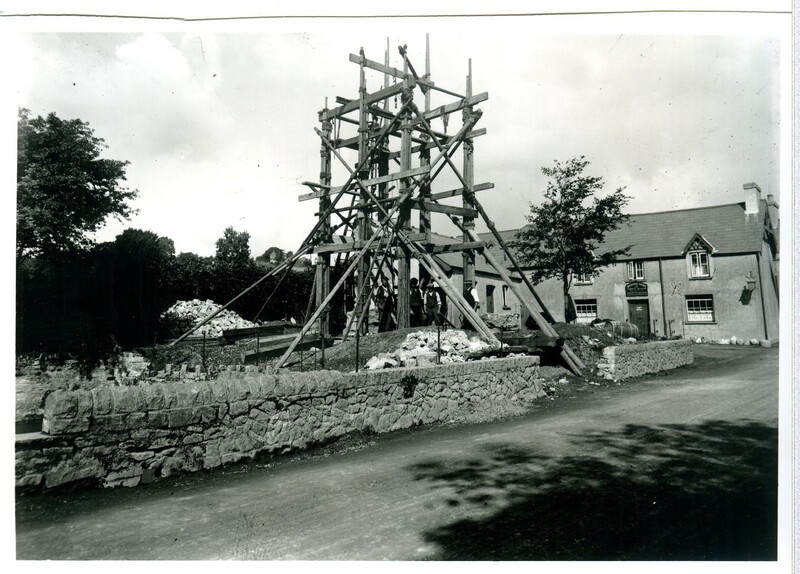 Of this about 38% was unskilled labour at 1/4½ per hour and 20% unnamed masons at 1/7 per hour. Named workers were responsible for the remainder of the work and were paid rates varying from 1/7 to 2/- per hour. 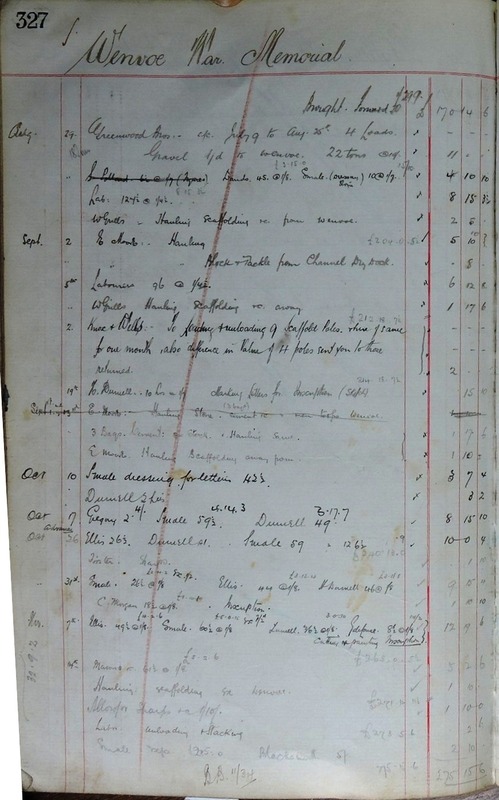 Together with the cost of materials, haulage, sharpening tools and hire of tackle and equipment and other incidental expenses day works came to £275:15:6 and a total of £289:11:4 was billed, representing a very modest profit of about 5%. The Day Book entries for the work are appended. An undated newspaper cutting, from an as yet unknown source, found in Clarke’s archive shows a photograph of the memorial.The caption beneath it states that there were 13 names of men who had fallen and 63 who had served, so no names have subsequently been added other than those who fell in WW2. 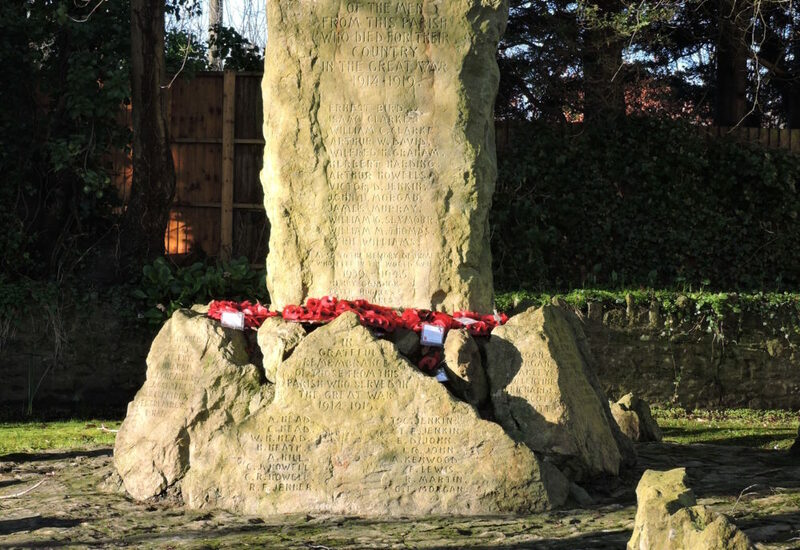 The caption also sums up the appearance of the memorial rather well – “The rugged primitiveness of the whole gives it an impression of nobility”. 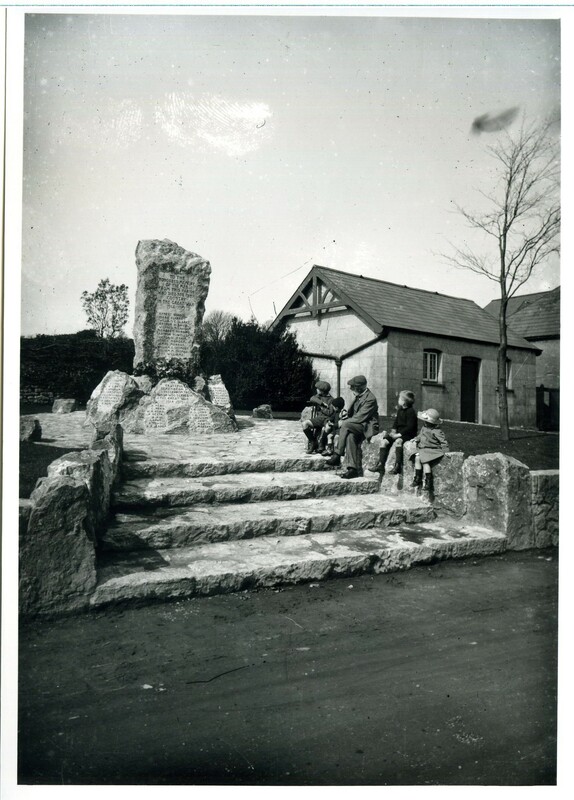 Clarke’s archive also contains photographs of the memorial under construction; Figure 5 and William Clarke siting beside the completed monument in the company of some children; Figure 6. The names that are no longer readable today due to weathering of the lettering can be seen clearly in a enlargement of this photograph. 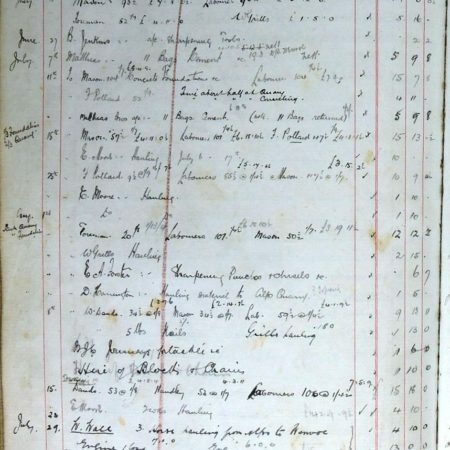 Clarke’s Account Book for the period 1900-1921 shows that C. D. Thompson was handling the collection of money for the memorial. This was Claude Dudley Thompson, Land Agent for the Wenvoe Castle Estates. 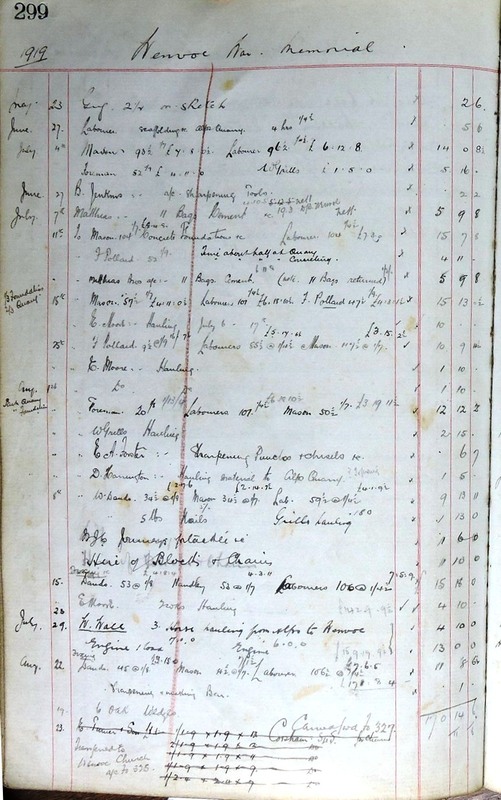 Other named contributors who have been identified from the 1911 census are Elvira John of ‘Rhua Farm’, Oliver Thomas of ‘The Greaves’ and the largest single contributor, Mrs Jenner, who was presumably the wife of the vicar George Herbert Jenner. Thanks to W Clarke, Llandaff for access and permission to reproduced material from their archive, which remain their copyright.